Douglas is married with five children and comes from Hectorspruit. He is one of the most experienced rangers and an excellent scout. He is considered the ranger with the most burning passion for nature. Jeffrey is 28 years old. 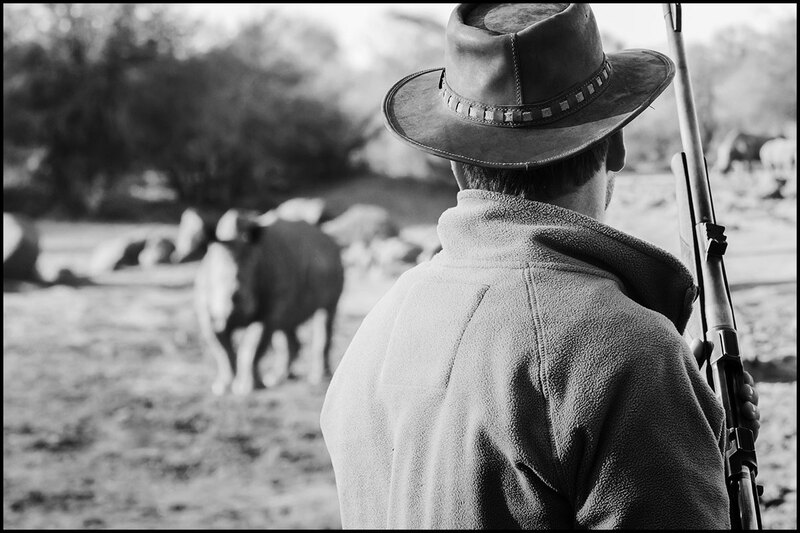 He was born in Dennilton, far from where he works now, protecting the rhinos. He is eager, hard-working and hungry to learn. He asks questions on patrol, is always alert and sees the small details that often escape others. Jeffrey is also considered to have very keen eyes making him an important member of the ranger team. He can be counted on for smiles every morning. His aim is to learn as much as he can about nature. Frank is 42 years old. He was born in Dennilton and is one of the newer members of the team, nevertheless he gets results because he listens so carefully. He is very committed to his task and always fulfills his obligations with a passionate dedication. Steve is 50 years old and happily married with three children. He is one of the newer rangers on the team and is excited to be part of the unit. Nkosinathi was born in Barberton. He is a single dad with two children. He is considered one of Care for Wild Africa's best scouts. When he is told to do a patrol, Nkosinathi can be counted on to literally go the extra mile. Even on rest days, he stays to do patrols. He has a fierce passion about ensuring that the rhinos remain safe from poachers. “I love the rhino, he shows me different things and he brings tourists to my country. I feel very bad about poachers, they finish our rhinos, but we cannot and must not allow this." Freddy is 27 years old. He was born in Ntwane and is one of the newer members of the ranger team. He is eager to learn and shows great potential. If he is sent on patrol, everything is committed to the job at hand. “I want to look after animals, protect them and make sure that they are safe from poachers. This is why I am here, because nature must continue.” He has impressed his co-workers with his genuine love of nature.